It’s a bizarre idea that shouldn’t be taken seriously. Alphabet's (NASDAQ:GOOG) (NASDAQ:GOOGL) Google could control 29.5% of the smart speaker market with its Home devices this year, according to eMarketer's latest estimates. However, Amazon (NASDAQ:AMZN) will still control 66.6% of that market with its Echo speakers and Alexa-enabled devices. Google gained ground over the past year with its Home Mini speaker, which cost just $50. In late May, research firm Canalys reported that Google shipped 3.2 million Home speakers during the first quarter of 2018, while Amazon only shipped 2.5 million devices. That marked the first time Google outsold Amazon in the U.S. smart speaker market. Google Home Mini. Image source: Google. eMarketer expects Google Home's market share to grow to 32.9% in 2020, compared to a 60.8% share for Amazon. Those figures sound promising for Google, but Morgan Stanley analyst Brian Nowak recently claimed that Google should go a step further and simply give every U.S. household a Home Mini speaker for free. Nowak believes that unconventional move would help Google counter Amazon and secure its position in the voice shopping market -- which could be worth $44 billion by 2022, according to Morgan Stanley's estimates. Nowak expects the giveaway to cost Google $3.3 billion but believes it will eventually recoup those costs five times over through operating profits from retail searches. Nowak is certainly thinking outside the box, but I doubt Google would ever consider following his advice. $3.3 billion is equal to nearly 16% of Google's free cash flow over the past 12 months. 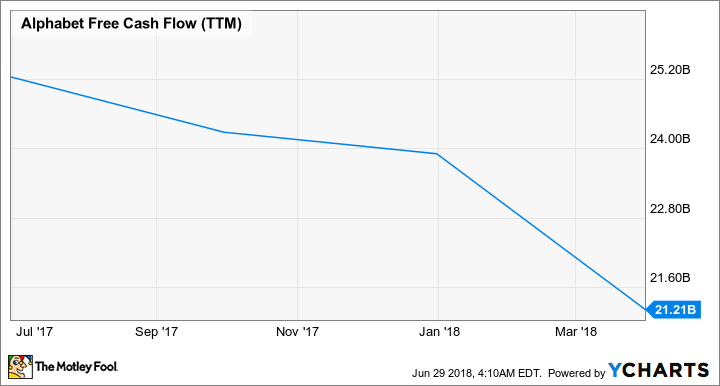 Google's free cash flow has been in a downtrend over the past year thanks to higher spending on the expansion of its ecosystem and investments in new areas like driverless cars, AI, and healthcare. GOOGL Free Cash Flow (TTM) data by YCharts. Instead of giving away speakers, Google could spend $3.3 billion on investments and acquisitions of smaller companies. Over the past year, Google acquired part of HTC's smartphone team for $1.1 billion, led a $1 billion investment round in Lyft, and invested $550 million in Chinese e-commerce giant JD.com. Those investments, which expanded its ecosystem, were arguably smarter uses of its cash. eMarketer and Canalys' reports indicate that Google is gaining ground against Amazon. Therefore, if people are already buying Home speakers, giving them away for free would be a pointless move that would merely upset customers who already bought one. Nowak also doesn't explain how Google would handle the logistics, or how it would determine if a household already owned a Home speaker. After all, a recent Voicebot.ai report claims that 20% of U.S. adults already have access to a smart speaker. Instead, Nowak suggests that Google should just give all households a Home Mini speaker, even if they already owned one -- which would be wasteful considering that Home could claim nearly 30% of the American smart speaker market this year. If Google actually gives away Home Mini speakers for free, Amazon would inevitably strike back with its own free speakers. However, Amazon can likely recoup those costs at a much faster rate than Google. Amazon's Echo Dot. Image source: Amazon. Nowak suggests Google could recoup the costs with a higher number of retail product searches, but Amazon processed 49% of all online product searches in the U.S. last year, according to Survata. Search engines, led by Google, only processed 36%. More importantly, the combination of Amazon's Prime ecosystem and Echo speakers makes customers spend a lot more money on its marketplace. Earlier this year, research firm CIRP reported that the average Echo owner in the U.S. spent $1,700 annually on Amazon, compared to just $1,300 for the average Prime member. CIRP previously estimated that non-Prime members spent just $700 per year. For Amazon, giving away a $50 Echo Dot to generate $400 more in annual sales per Prime member would be a smart move. Giving away free speakers as a signup bonus for Prime could be an even better idea. For Google, the benefits would be harder to quantify. Google might eventually recoup its speaker costs with voice shopping and product search revenues, but those efforts could be hampered by its lack of a comparable e-commerce marketplace. So, instead of goading Amazon into an all-out war with free smart speakers, Google should simply maintain its current course of selling cheaper speakers while expanding Assistant's skill set. Google gives away many software products for free to expand its ecosystem, but hardware is a different ballgame. Wasting $3.3 billion on free Home Mini speakers is a terrible idea, and it's a strategy investors should hope Google never pursues.